A female kākāpō raises her young unassisted, incubating her eggs and feeding the chicks while walking long distances for food. Here an adult named Alice is feeding her 12-day-old chick, photographed in her nest on Codfish Island by wildlife officer Don Merton. 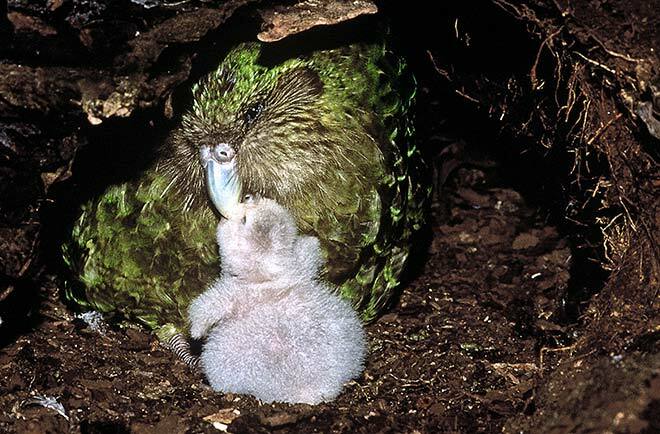 He was involved with kākāpō recovery since the first birds in the managed breeding programme were tracked down in Fiordland in the 1970s, and later on Stewart Island. Alice lives as a wild bird, but is watched closely to ensure her chicks have the best chance of survival.